Who Will Talk About Iran’s War Crimes in Syria? There is documented evidence that Iran and its allied Shiite militias committed atrocities against civilians in Aleppo. Russia may be found liable as well. Will justice ever be served? It was a brisk, sunny morning in Damascus on December 15, 2016, and for Syrian President Bashar al-Assad, it was the moment he’d longed for since the outbreak of civil war in 2011. As word came that a plan would soon be in place to forcibly expel the city of Aleppo’s remaining 50,000 militiamen and besieged residents, Assad quietly delivered a long-awaited victory speech on his official Facebook page. Lacking the bravado of Franco and the ferocity of Hitler, Assad simply grinned and spoke directly to the shaky camera. “Time and history are directly intertwined,” he said. Time becomes history when significant events determine the tide of time, translating into history. We talk about the time before Christ and the time after Christ. We talk about the time before the revelations of the prophet Mohammed and the time after the revelations of the prophet Mohammed. What I am saying is that history is never the same after these events. … I think after the liberation of Aleppo, we will say that the world, not only Syria or the Middle East, but that the world will be discussed in terms of time before the liberation of Aleppo. Here, Aleppo has transformed time into history. … This is a history that is being written right now. … A history that is being written by every Syrian citizen. It has not started today, but six years ago when the crisis began. With ceasefire talks in limbo and Assad’s military having finished bombarding the grim two-square-kilometer pile of rubble that was now Aleppo, these words rang through the streets of Syria and across social media networks. Bashar al-Assad, the great liberator of Aleppo, had finally gained his greatest military victory. Indeed, the capture of Aleppo is only one step in Iran’s master plan to control a “Shiite Crescent” stretching from Tehran to the Mediterranean. But this imperialist vision has come at a tremendous cost to other human beings. Iran’s ambitions and Assad’s role in them have and will continue to be typified by mass human rights violations, particularly the ethnic and political cleansing of Syria’s civilian population. Despite the recent UN General Assembly resolution calling for a war crimes investigation and the deployment of UN observers to Aleppo, Assad and his Iranian and Russian backers have proven that they are capable of carrying out crimes against humanity on a mass scale. Aleppo represents this in microcosm. Once the country’s cultural and economic hub, the city of has witnessed the largest civilian displacement since the civil war began. Through its Syrian and Lebanese proxies, Iran has initiated what many have called the ethnic cleansing of Syria. When the International Committee of the Red Cross finally arrived to assist in the evacuation of Aleppo’s approximately 70,000 trapped civilians on December 14, Marianne Gasser, head of the ICRC in Syria, painted a bleak picture of the situation. “There was firing before we entered East Aleppo for the first evacuation,” she said. Right up until the last minute, it wasn’t clear we’d get in. A crane was used to remove some of the debris from the street so the ambulances and buses could get through. There were burnt-out cars. Smoke rising from nearby buildings. There was a lot of fear and uncertainty. When we arrived, the scene was heartbreaking. People are faced with impossible choices. You see their eyes filled with sadness. It was very moving. No one knows how many people are left in the east, and the evacuation could take days. There is little documented proof as to the identity of the shooters, but ITV cameraman Barnaby Green found Hezbollah fighters and flags inside the city just 24 hours later. Additional photos from the Free Syrian Army’s press office appeared to show Qassem Soleimani, the commander of the IRGC’s elite Quds Force, walking the newly conquered streets of Aleppo a day later. Despite the shooting, several other convoys made it safely out of the city by nightfall. The rocky nature of the ceasefire, however, and poor security provided for the refugee convoys, hinted at the horrors that lay ahead. What happened next highlighted Iran’s ability and willingness to carry out or support a continued pattern of abusive sectarian behavior, and cemented its place in the history of modern ethnic cleansing. As activists said their final goodbyes to Aleppo prior to boarding the dreaded green buses in the morning hours of December 16, the evacuation process was expected to continue as planned. What occurred over the following hours provided a modern-day, real-time example of the Rashomon Principle, where there is no such thing as objective truth, only different points of view. A barrage of heavy gunfire suddenly rained down on a number of vehicles. The initial reports of gunfire were captured by a Russian Defense Ministry livestream of the evacuation process. The regime claimed that rebels were holding hostages, leading to a pause in the evacuation. Videos from people aboard the convoys, however, show dozens of civilians fleeing gunfire near what appears to be the Amiriya checkpoint in southern Aleppo’s Ramouse District. The first video to emerge from the incident, captured by Aleppo resident and convoy passenger Haleem Kawa, showed a horrific scene with women clutching their babies as people of all ages flee an eruption of gunfire. The roaring engines of military vehicles are heard in the background. A number of wounded people limp their way back to the convoy, including Aleppo dentist and pediatrician Dr. Salem Abu Nasr. 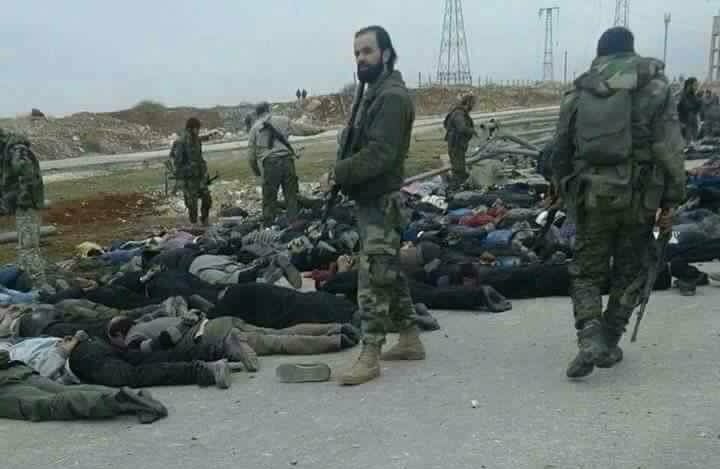 Amid the conflicting reports, a ghastly photo was disseminated by Free Syrian Army political officer Asaad Hanna, purporting to show that “Iranian militias [had] arrested civilians.” The imagery invokes horrifying memories of Srebrenica, Kigali, and Auschwitz. While the photo has yet to be independently verified, it does show an area similar to Ramouse Road near the checkpoint in question and what appear to be hundreds of bodies lying face down on the ground. At least seven armed men dressed in dark green military fatigues similar to those worn by both Hezbollah and Iran-affiliated militias are standing over the line of bodies. There is no indication, or implication, that the people on the ground are deceased, yet it lends further credence to the narrative beginning to unfold. Amid the conflicting reports coming out of the Ramouse District, the ICRC’s Robert Mardini immediately put the evacuation on hold. By that point, approximately 8,000 people had been successfully evacuated, leaving some 42,000 civilians trapped inside the rubble that was once their home. Anti-government sources blamed Iranian militias for the stalled evacuation, while pro-government sources blamed rebel fighters. A new information campaign is gaining momentum. Some Western politicians are talking about alleged killings of civilians during the operation for Aleppo’s liberation. According to them, the streets are full of corpses while thousands of residents are still hiding in basements. … That information is a blatant lie. Officers of Russia’s Center for the Reconciliation of the Warring Sides in Syria and representatives of the International Red Cross Committee entered the Aleppo districts liberated from militants together with Syrian servicemen, but found no corpses there. Besides, unmanned aerial vehicles were broadcasting in real time to the entire world. Our people are working on the ground and we’re receiving first-hand information rather than information from social networks and militants’ websites. Rudskoi’s final sentence provided a perfect example of the tactical awareness of the Russian propaganda machine. Since the aggressive multilingual social media expansion of both RT and Sputnik, among other platforms, Russian counter-intelligence has continued to obfuscate and propagate stories with little if any factual evidence. This is precisely what they did in regard to Aleppo. But they couldn’t have anticipated how their narrative would be rewritten on social media. Within hours, activists aboard the convoy confirmed that they were turned around and brought back into the besieged area of the city, and soon posted a series of testimonies regarding the incident. Several people aboard the convoy, including activists and White Helmet volunteers, explained that Iranian militias stopped all of the buses, pulling as many as 950 people out into the cold. Many were questioned at length by militiamen, who chose people based on lists of names they had been given. Some of those questioned were known Syrian rebels, all of whom were taken away to another location. Others stated that civilians were amongst those abducted from the convoy. The most alarming claim, however, which has continued to reverberate on social media, is that the militias carried out a number of summary executions. The convoy that set off today carrying 800 people, including rebels, was held by Iranian militias in the area between Jisr al-Hajj and the 1070 Apartment complex (southern Aleppo). Around 20 buses set off on the convoy, alongside ICRC and Syrian Arab Red Crescent vehicles crossing through a Russian-manned checkpoint only to be surprised by another one set up by Hezbollah. The convoy stopped for 15 minutes, then tanks and soldiers in vehicles surrounded the convoy and fired indiscriminately in the air, leaving the humanitarian ICRC and SARC vehicles to quickly leave the area. … Militias then forced all men to get off the buses, confiscated their weapons and mobile phones, and forced them to strip down to their underwear. … Iranian militias arrested some fighters, as well as the team responsible for the evacuation, including White Helmet members, and killed three and critically injured at least five others. … They confiscated some of the White Helmet cars and then forced the convoy to go back to the besieged area of Aleppo, and some of the buses are still missing. With the influx of activist reporting, coupled by intense global media coverage over the next 18 hours, a pro-regime reporter confirmed in a live December 17 broadcast from Ramouse that Hezbollah militiamen stopped the convoy, but claimed “we stopped them” from carrying out any violations of the ceasefire agreement. In a clear miscommunication with his Syrian counterpart, Yemen-based Leith Abou Fadel, the CEO of the regional pro-Shiite al-Masdar News, tweeted a photo from a Syrian Hezbollah channel on the messaging app Telegram showing one of the Syrian rebels abducted during the incident. The post suggested quite literally that he was captured, along with others, at the Ramouse Roundabout on December 16. With evacuations in flux and a return to the negotiating table between Russia, Iran, Turkey, and Aleppo-based rebels, a group of Syrian Hezbollah militiamen from the twin towns of Nubbul and Zahra, which have been virtually under siege by Syrian rebels for nearly two years, began chatting on Telegram and Facebook boasting of their recent endeavors. The group in question was the Syrian Hezbollah Zulfiqar 2B Regiment, whose men bragged that they had indeed taken hostages, but said, “We won’t execute any, they are kept safe.” In a similar conversation thread, one man said that during the incident, he shouted, “This is the fate of your fighters if you do not open the road to Kafraya and Al-Fou’aa,” a reference to a negotiating point not included in the original ceasefire agreement. This issue, which would later be included in a December 18 agreement, called for the evacuation of Shiite towns controlled by Iranian, Syrian, and Lebanese militias loyal to the Assad regime. It included the demand for evacuation of civilians and military forces from the aforementioned towns in Idlib province, which are currently besieged by Syrian rebels affiliated with Jaish al-Fateh. Yahya Ali, a Syrian Hezbollah commander in the Aleppo province, explained on Facebook that “Only Nubbul and Zahra men humiliated Aleppo militants.” Adding further weight to the claim that Syrian Hezbollah militiamen abducted a number of people from the convoy, a leading Iran-educated Shiite cleric in Zahra, Muhieddine Muhieddine, lauded his fighters’ actions and openly admitted to intercepting the buses, taking off “militants,” and keeping several of the vehicles. Muhieddine is an important character at this stage of the story, because alleged documents recently leaked by the People’s Mujahidin of Iran, an Iranian counterrevolutionary group (which was considered by the U.S. to be a terrorist organization until 2012), show that Muhieddine received 185 million Syrian pounds (approximately $860,000) from Iran in September 2014. The sum, intended for Muhieddine’s Emergency Center for Nubbul and Zahra, was sent via the Fazel Exchange Company in a wire transfer signed by Sayyid Abdullah Nizam, a prominent Damascus-based Shiite cleric. Nizam is widely considered one of the most powerful Iranians in Syria, and formally serves as the Dean of the Faculty of Islamic Studies at the Iranian-funded al-Mustafa University; its sister institution lies in the Iranian holy city of Qom. In other circles, he’s considered the head of the Iranian Martyrs Foundation in Damascus, which gives him the authority to distribute both religious and military funds to the entirety of Syria’s Shiite community. Before the Islamic State’s conquest of Raqqa, “Abdullah Nizam was the main supervisor over the process of Shiitization in the city of Raqqa and its countryside; he pumped millions of pounds into the city in order to Shiitize the people in the region and to construct Shiite mosques and shrines there,” doctor-turned-activist Osama al-Raqqawi said in 2014. Nizam has also been called upon by Shiite communities throughout the country, asking for funds to support their besieged communities in areas where the population is predominantly Sunni. This included, according to the alleged documents, Muhieddine’s operations in Nubbul and Zahra. His Facebook bragging adds credence to the notion that such funds went to support his local militia, a regiment of the Zulfiqar Battalion, otherwise known as Syrian Hezbollah. Nubbul and Zahra have been a major headache for the Iranian axis since the early days of the Syrian conflict, when the Free Syrian Army initiated an almost four-year siege of the area in July 2012. Located only 15 miles northwest of Aleppo, the area served as a microcosm of the entire sectarian conflict in Syria, with myriad rebel and Iranian-backed forces involved, including the formerly al-Qaeda-linked Jabhat Fateh al-Sham and the increasingly powerful axis of IRGC-backed ground forces and the Russian Air Force. The money sent to Muhieddine came at a crucial time in the conflict, just months ahead of a large-scale rebel offensive and ensuing regime counter-offensive that led to a number of minor territorial exchanges in 2015. It wasn’t until February 2016 that the two Shiite towns were fully recaptured by an IRGC-backed operation that included, amongst others, Muhieddine’s Zulfiqar Battalion. It took forces loyal to the Assad regime nearly 10 more months to reach the city of Aleppo, and the Iranians have slowly amassed what could be as many as 25,000 foreign forces in the greater Aleppo area. The IRGC’s Quds Force led a group that included Lebanese Hezbollah, 10 members of the Iraqi Popular Mobilization Units, the Afghan Fatemiyoun Brigade, the Pakistani Zeynabiyoun Brigade, and several Syrian militias including the Zulfiqar Brigades. With Soleimani in Aleppo overseeing the final attack in mid-December, as well as unconfirmed reports that all checkpoints in the city’s Ramouse District were under the control of the IRGC, one can see a direct link between Tehran, Hezbollah, and the December 16 convoy attack. Many of the groups in Aleppo have used similar tactics in predominantly Sunni areas of Iraq’s Anbar and Salahuddin provinces, where numerous human rights violations have been reported over the past year. These instances, including torture and execution in Fallujah, and looting and destruction in Tikrit, displayed a pattern of belligerent behavior that failed to capture the attention of the international community, in large part because of the anti-ISIS focus of the prevailing narrative. But Aleppo is different, because these regime-allied groups aren’t fighting ISIS. They are waging a war against a civilian population that began a popular uprising in 2011, but whose cause was later hijacked by numerous rebel groups, both local and foreign. They are waging a war against people like Bana al-Abed, a seven-year-old Harry Potter-obsessed girl from Aleppo; Omar Daqneesh, the five-year-old boy whose blood and ash-covered face shocked the world this past summer; and the White Helmets, a ragtag collection of local heroes who risk their lives every day in an effort to save their fellow Syrians from airstrikes. They have all been forcibly displaced from their homes, or worse, killed. After additional breaches of the ceasefire on both sides, as well as negotiations with the Iranians and Russians, the ICRC announced that the evacuation of the city’s besieged area was completed on December 22. “Our priority, aside from helping the most vulnerable, was to ensure that civilians were leaving of their own free will,” said Marianne Gasser, the ICRC’s Head of Delegation in Aleppo. These are communities whose neighborhoods have been devastated by violence, and families have been struggling for months to find safety, food, medical care, or appropriate shelter. They appeared desperate to leave, even though the situation was extremely painful and confusing. Civilians who … chose to leave must be able to return to their homes when they want to. Many will one day want to come back. With a combination of reliable testimonies and videos from those who were on the Ramouse convoy, a photo purported to show an image very similar to the checkpoint in question, and some quiet bragging from a group of pro-Assad militiamen near Aleppo, there is mounting evidence that Syrian Hezbollah militiamen from the northern Aleppo countryside may have carried out multiple breaches of the ceasefire agreement. This incident, along with countless other crimes committed by Iranian-backed forces in Syria, could one day be investigated by institutions like the International Criminal Court (ICC). The New Yorker’s Ben Taub wrote a powerful piece calling for the invocation of the Rome Statute, the founding document of the ICC, to reframe the discussion about Syria into a narrative of war crimes and crimes against humanity instead of human rights violations. He makes a valid point, citing numerous descriptions and documentation of mass killings and forced displacement in Syria, but he also reminds us that the ICC “has no jurisdiction over Syria, because Russia, voting no alongside China, obstructed the conflict’s referral at the UN Security Council in 2014.” Harvard Law School professor and former ICC prosecutor Alex Whiting’s initial breakdown of the resolution’s limitations was best described as hopefully pessimistic, citing the obvious unlikelihood that “all States, all parties to the conflict as well as civil society” would cooperate to enforce it in the short-term. It’s important to note that the ICC cannot technically apply its jurisdiction over any other parties involved in the Syrian conflict, including Iran, Russia, Hezbollah, the Islamic State, and al-Qaeda among others. That said, the system could change one day, and the vague and opaque language of the General Assembly resolution may offer a tiny glimmer of hope for future generations of Syrians. The Aleppo expulsion may have been completed, but the displaced residents of the city, many of whom will move to rebel-held areas of Idlib province, will continue to be moving targets for the regime and its allies. Assad has made it clear that he plans to capitalize on the Aleppo victory, having already issued Syria’s largest military call-up since the Yom Kippur War. With significant momentum from the capture of Aleppo, the surrounding areas could easily become the site of further human rights violations. With this in mind, it is clear that the ultimate victor is Iran. There, Qassem Soleimani plots the IRGC’s ongoing campaign to expand its sphere of influence. With Russian backing at the UN, the Iranians are virtually bulletproof in Syria, and Aleppo has proven that fears about the scale and scope of war crimes committed in the conflict were completely justified. While the Iranian regime has proven that it can silence its own population online, the Syrian opposition, particularly those involved in the documentation of the recent battle over Aleppo, can never be silenced. The power of social media has given not only a voice to the voiceless, but a lens through which those of us in the privileged world can see the brutally dark reality of the Syrian civil war. As the West contemplates its next steps, it must look carefully through this lens, because it will mean the life or death of millions of innocent people. At the same time, there is a strong force, based in Moscow, Tehran, and Damascus, that seeks to distort the realities of the Syrian conflict. As recently as December 15, amid the stalled evacuation crisis, RT claimed that the fearful Aleppo civilians posting their last messages on social media were nowhere near Aleppo. The story even went on to question the existence of seven-year-old Bana al-Abed, who recently arrived safely in Turkey. Her stories of watching Harry Potter movies and wanting to read books became relatable narratives to Western audiences that, for the most part, had turned a blind eye to the Syrian conflict.